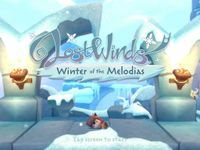 "LostWinds: Winter of the Melodias" is a platform/adventure video game by Frontier Developments for the WiiWare platform. It is the sequel to the 2008 platform adventure LostWinds, and sees the game's protagonist Toku searching for his missing mother while also trying to uncover the fate of the Melodia people who disappeared from Mistralis years before. The story of the game is self-contained, and as such, having played the first LostWinds game is not necessary to enjoy it. According to the developers, they took the length issues of the original LostWinds into consideration while developing the sequel. Source: Wikipedia, "LostWinds: Winter of the Melodias," available under the CC-BY-SA License.